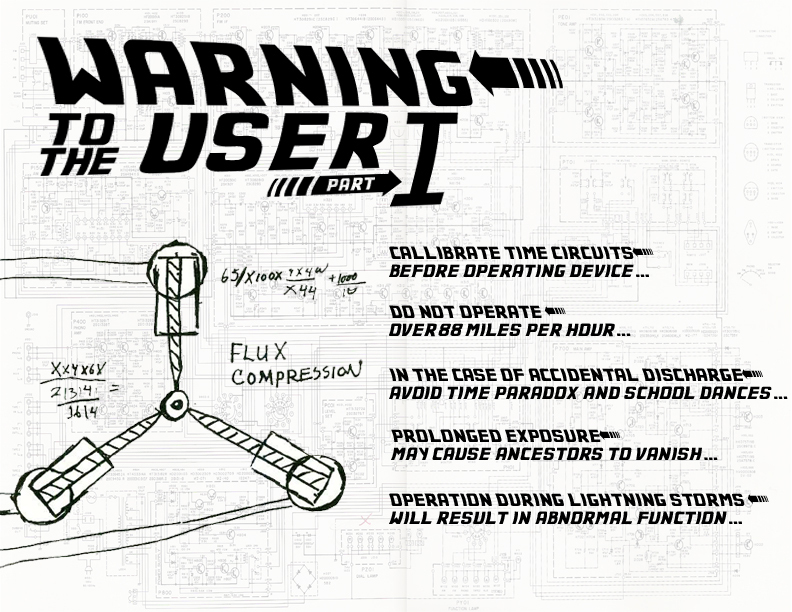 As a part of the increasingly mind boggling and transformative ds106 course that I’m currently participating in, I created this warning poster for a rather infamous piece of fictional technology; the flux capacitor. The assignment itself was based on the work of an excellent graphic artist with a streak of dark humor. However, I wanted to personalize it a bit, and thus I choose a device from a film that formed the basis for what I know of excellently cheesy science fiction flicks. Rather than choose the standard “ray gun” warning poster, I opted for a machine that could produce irrevocable harm to the entire space/time continuum rather than just blasting a hole in someone in a futuristic bar fight. Besides the humor that I tried to inject in the piece, and the design work that went into assembling it (no, I didn’t draw the flux capacitor myself), I wanted this assignment to serve as a practical way for teachers to leverage visual media as a way for students to practice summarizing, recalling, and recognizing plot development. While not every teacher and/or student is going to be able to put together a visual “road map” of a piece of literature using Photoshop, there are plenty of other ways to do it! My example above simply boils down to the major plots of the movie in a rather mundane bullet-pointed list, but presented from a humorous angle. It would be just as easy for students to use any word processor to arrange text boxes and clipart, or an online tool like picnik or piclits. Those would be much more limited explorations of visual summarization techniques though, as building and creating something from scratch would allow for ultimate creativity and ownership on the part of the students. And it’s not like it’s something they haven’t done before; graphic organizers, Kidspiration, and other mind mapping tools get wide use in schools as teachers look for ways to help their students brainstorm, scaffold some understanding of a new concept, or just try to visualize learning connections. If you’ve never done it before, creating a stylized visual narrative for trying to convey a larger body of work is a blast, and you can download a free 30 day trial of Photoshop CS5 and then use the awesome resources at Adobe TV to get your feet wet with it. That, or find a student to show you the ropes (they know everything these days). This is just amazing I loved all of the Back to the Future movies! Even used the same warping of text as the movies do, well done! Kind of a nerdy question though, wouldn’t it be “Do not operate at or above 88 miles per hour?” Since 88 is when you would experience time travel? Or are you saying that at 88 mph is what would make the flux capacitor kick in and time travel would occur so you can’t operate it above this speed? Haha very true, now I wish they had made it clear in the movies whether the flux capacitor works at 88 mph and higher or if it only works at that specific speed. Wondering if one could go into a loop of continuously traveling to the specific time they set the DeLorean for if they were to travel faster (or if they just set cruise control at 88), who knows. Makes me want to watch the movies again! And a curiosity…i was in Poland and i found this fantastic comics “Tytus, Romek i Atomek” (names of the protagonists) . I dont know why i mentioned it, but i feel it somehow related.